The Freezer 33 eSports ONE is a powerful Tower CPU cooler equipped with our new BioniX Fan. Thanks to a newly developed thermal coating and our new BioniX F120 fan the cooler gives you top notch performance for CPUs with a TDP up to 200 W.
The contact surface of the Freezer 33 eSports ONE heatpipes does not cover the full protection cap, but, more importantly, is right where the processor DIE is and cover even the largest versions (18 core) completely. This leads to maximum performance. thanks for ARCTIC's PST (PWM Sharing Technology) to keep the overall noise level minimal yet the cooling performance as needed. Fast and easy to install and extremely reliable, the different mounting systems are compatible with Intel and AMD sockets. 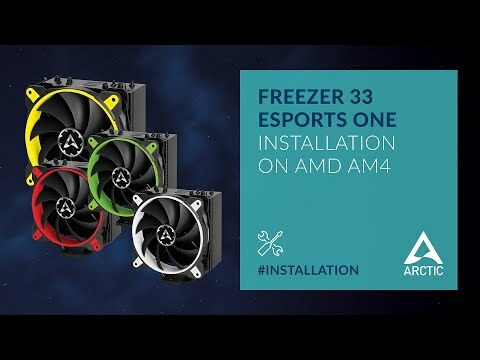 Thanks to a backplate and a significantly lower weight compared to the i30, the Freezer 33 eSports ONE is not only fool-proof to install, but also absolutely transport safe. Thanks to the compact dimensions of only 123 mm x 150 mm x 88 mm, there are no restrictions when using RAM modules. Even RAM modules with larger heat sinks can be mounted without any issues and are not blocked by the CPU Cooler. Features • Includes BioniX Fan with Best Airflow to Noise Ratio. • New, Quiet ARCTIC Motor. • PWM Sharing Technology (PST) Regulates Fan Speed Synchronously. • Longer Service Life Through Low Coil Temperature. • Compatible with Intel & AMD Sockets. • Special Thermal Coating and Offset Heat Pipes Ensure Optimal Heat-Dissipation and Increased Cooling Performance. • Anti-vibration Rubbers for Quiet Operation. • Transport-Proof Mounting with Backplate. • MX-4 Thermal Paste Included . Freezer 33 eSports ONE Single Tower Cooler, 4 Heatpipes, 1800 RPM BioniX 120mm Fan, 115x, Fluid Dynamic Bearing, White is rated 5.0 out of 5 by 1. Rated 5 out of 5 by abotfarmer from outstanding cooler fantastic cooler , i added a second fan just to be on the safe side as i was overclocking my amd 2600 but to be honest im not sure i needed to as even when pushed hard my cpu rarely goes above 58c . only issue is that its a kind of a tight fit with 4 sticks of ram fitted so i found it easier to fit thew ram after the cooler. The cooler seems to perform at the same level at bigger competitors air coolers but in a slightly more compact size so eliminating the risk of not been able to close the pc case.